Minister of State Seán Kyne TD (Government Chief Whip and Minister of State for Gaeilge, the Gaeltacht and the Islands), and Mr Tom Boyle (Ireland’s oldest third level student). At 81, Mr Tom Boyle is Ireland’s oldest third level student and he is studying Irish and English on the BA Arts (Honours) at Waterford Institute of Technology. 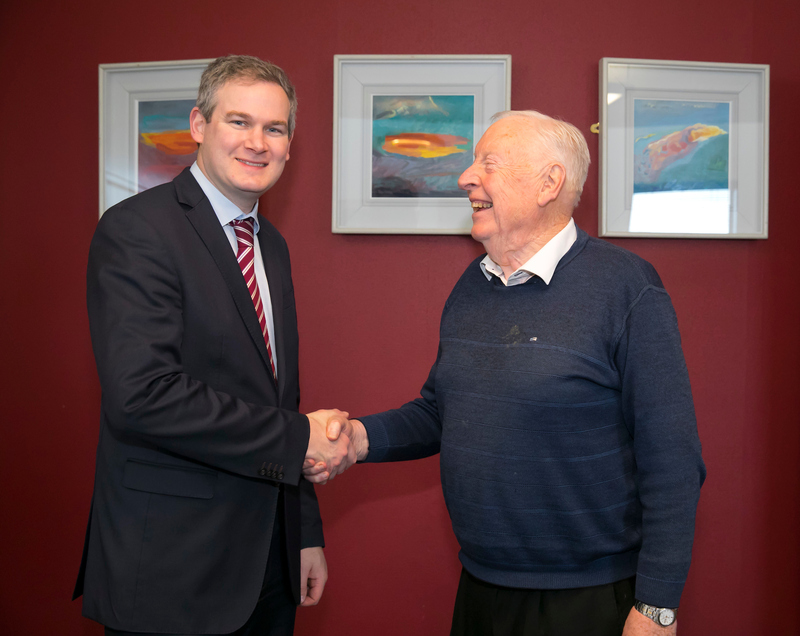 On a recent visit to WIT, Minister Seán Kyne (Government Chief Whip and Minister of State for Gaeilge, the Gaeltacht and the Islands) readily took time out of his schedule to meet Tom. The Minister was eager to know how Tom was getting on with his studies. “It can be difficult at times, but I am getting on great. My only regret is that I didn’t return to college sooner,” said Tom. BA Arts (Honours) course leader Dr Séamus Dillon, one of Tom’s lecturers said the Tom’s age is rarely a factor in his studies and that he wants to be treated no differently to his classmates: “Tom is a great character and his presence adds a very positive atmosphere to the classroom. He is always ready to share his experience, his knowledge and his love of learning with his classmates,” added Dr Dillon.